In 2009, and in absolute terms, about 19.9% (608 TWh) of Europe's total electricity consumption (3042 TWh) came from renewable energy sources. Hydro power contributed with the largest share (11.6%), followed by wind (4.2%), biomass (3.5%), and solar (0.4%). With regards to the new capacity constructed that same year (27.5 GW), among the renewable sources, 37.1% was wind power, 21% photovoltaics (PV), 2.1% biomass, 1.4% hydro and 0.4% concentrated solar power, whereas the rest were gas fired power stations (24%), coal fired power stations (8.7%), oil (2.1%), waste incineration (1.6%) and nuclear (1.6%). As not all installed technologies operate continuously 24 hours a day, figure 2 shows the expected yearly energy output (TWh) from the new capacity. The new gas-fired electricity plants will deliver yearly 28 TWh, followed by wind and PV with 20 TWh and 5.6 TWh, respectively. If current growth rates are maintained, in 2020 up to 1400 TWh of electricity could be generated from renewable sources, the report concludes. This would account for approximately 35-40% of overall electricity consumption in the EU, depending on the success of community policies on electricity efficiency, and would contribute significantly to the fulfilment of the 20% target for energy generation from renewables. However, it also advises that some issues need to be resolved if the targets are to be met. Particular areas of focus include ensuring fair access to grids, substantial public R&D support, and the adaptation of current electricity systems to accommodate renewable electricity. The study highlights that cost reduction and accelerated implementation will depend on the production volume and not on time. Wind energy: with more than 74 GW of total installed capacity in 2009, it has already exceeded the 2010 white paper target of 40 GW by more than 80%. 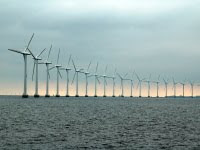 The European Wind Association's new target aims for 230 GW of installed capacity (40 GW offshore) by 2020, capable of providing about 20% of Europe's electricity demand.